The European Union and the Ministry of Foreign Affairs of the Republic of Korea co-sponsored a seminar on the nuclear and ballistic missile dimensions of the DPRK crisis, which took place in Seoul on 24-25 October 2016. 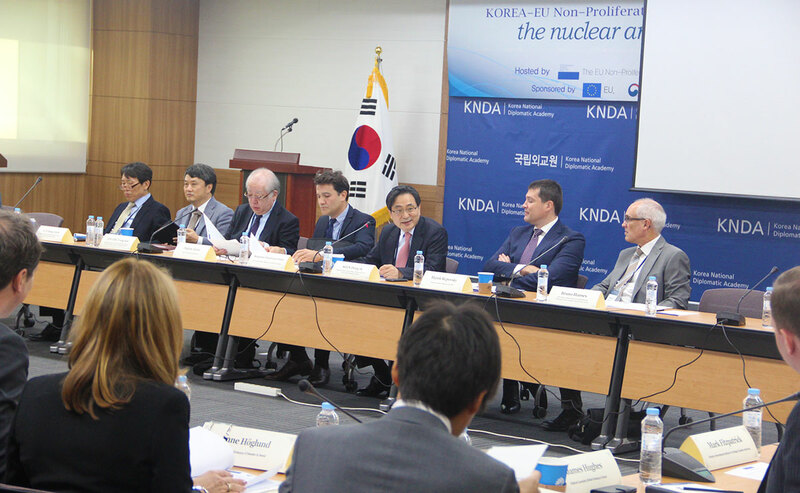 The seminar was co-hosted by the EU Non-Proliferation Consortium (EUNPC), the Institute of Foreign Affairs and National Security (IFANS), the Korea National Diplomatic Academy (KNDA) and the Korea Nuclear Policy Society (KNPS). The seminar brought together some 60 participants from governments and think-tanks in Europe, North-East Asia and the United States. Participants shared their assessment of the DPRK nuclear and ballistic programmes, reiterating their grave concern about the threat that this programme constitutes to regional and international stability. Participants also shared their views on how the international community, including the EU, should best respond to the persistent violation by the DPRK of multiple UN Security Council Resolutions. They discussed in particular the effectiveness of a diplomatic response, including sanctions, as well as counter-proliferation solutions and options. Participants agreed that the seminar had provided a very useful opportunity for sharing views and assessments. They expressed the hope that the dialogue and exchange on this issue would continue, including in the framework of the bilateral relations between the EU and the Republic of Korea. 09:45 – 11:50 Session 1: The DPRK nuclear and ballistic programmes: what assessment? Session 3: What more can be done or how different? 09:00 – 11:00 A specific role for the EU?